OK, you’ve made it outside or at least to where you are comfortable. Now it’s time for the fun to begin. You are holding the tail of the surfboard and might be giving your surf dog words of encouragement. This is the easiest and most fun part of surfing with your dog. Because you are holding the tail of the surfboard it’s quick and easy to turn the board around and aim it towards the beach. I ALWAYS do it the same way. Because my dog then knows what to expect! I always turn the surfboard counter counterclockwise around me. It doesn’t matter which way you go. Find out what works for you and do it the same way each time. Another reason for holding the back of the surfboard is you can turn and push quickly. You never know when that perfect wave is coming. In the mean time, we are always facing out so we can see what’s coming and go over the waves easily! You’re going to want to start by 'surfing' (launching, pushing, guiding, easing) your Surf Dog into the soup (white water) first! They can surf the unbroken waves later after they are comfortable with this whole idea of surfing! O.K, you now see that perfect wave coming and have turned around. FIRST...Make sure there are no people or dogs in front of you!!! 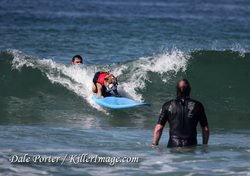 Now.....Is your Surf Dog in the right spot? His he/she in the back 1/3 of the surfboard? (My dog tends to creep towards the nose as we head out and are getting into position. 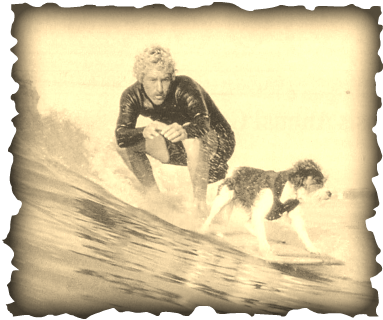 I always say something to my Surf Dog like “here we go” to prepare them for what’s going to happen next. Remember, your dog has never experienced anything like this before! As the wave starts to overtake you, it’s time to start gradually pushing a little faster. The idea is to get the surfboard moving at the same speed as the wave! This will take some practice. Some days the waves are fast and some days they are slow. 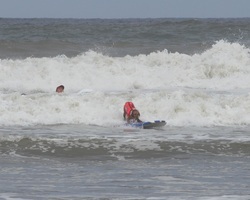 If you push them too soon, they will get out in front of the wave and slow down and maybe even stop. This is not good. The wave will catch up to them and blow them off the board. If you push them too late, they won’t be able to get into the wave and will just end up coming back over the top of the wave and stopping. With a little practice, you’ll figure out what works. On faster, larger waves, I sometimes do not let go of the surfboard right away. I’ll just hold my breath and hold on to the surfboard for 2 or 3 seconds. This affords me the opportunity to steady the surfboard. When I feel like the surfboard and wave are one........ I let go. You can surf your dog straight in towards the beach or give them a slight push to the left or right. This will develop into a longer ride but requires a little more balance and experience. For now, push them straight in! With experience you will be able to push them into the unbroken part of the wave and go either left or right across the face of the wave. This is the Ultimate ride! Here's a short video my friend Deb Spoonhour made of me and my Surf Dog Nani at the 2010 Purina Incredible Dog Challenge Surf Dog Competition in Ocean Beach. Note how all of the points made above are actually used to get Nani outside and into a wave. By the way....She Won First Place in the Large Dog Division of this Competition! Her best friend Surf Dog Dozer won First Place in the Small Dog Division! You are outside and your dog is moving away from you. You don’t get to see them surf. Hopefully someone is taking photos for you to look at later. There’s also a good chance your Surf Dog doesn’t like the idea that they are surfing away from you. They will most likely turn around to look for you. When they do this, they might jump off to get back to you or they may fall off. See Wipeouts in the next chapter. Now your dog is happily surfing towards the beach. You need to make your way in to retrieve them. (Note: You're not going to "Catch" them,....again, this is not baseball and they are not falling!) They finished their ride and you will need to "Retrieve" them so you can do it again. Here’s the great workout we were talking about. (As if working your way out into the surf wasn’t enough already). You can walk in, run in, swim in or body surf in. This might take a little while so get going. 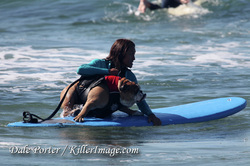 Any way you do it, get to your Surf Dog quickly. They could be swimming or could be waiting for you on the beach. Either way, most dogs do not like being separated from their owner. If you have a friend, your SDR, helping you, they can get your Surf Dog back on the surfboard and start pushing them back out to you. This will save time and energy! Make sure they have read oand understand what has been discussed in these lessons or you have explained to them what you expect of them. You won’t believe how tired you’re going to be. In competitions where you only have a limited amount of time, having help retreiving will assure you get the maximum number of waves.